It's been quiet around here. So much so that it felt stiff to log on to the blog when it's typically such a subconscious, frequent pattern. I promise that I've been away building a fabulous goodie basket. Wonderful things have been happening. A big bucket list life item as a matter of fact. Knocking this big one off my list has been surreal. At various points in my life I have fallen in and out of love with the notion of owning a business. I've waffled between a dreamy, independent adventure and a disaster of a responsibility. And now it feels right. I have plans and real opportunities. And I have something, maybe a lot of things, to say. I always loved how her name rolled off my tongue. Of course, she never used that name nor most other nicknames or terms of endearment like "Mom" or "Mommy." My paternal grandmother had everyone - save her grandchildren - call her Nellie, even her two dear sons. I knew her in the last 16 years of her life when she would often tell me that, "Growing old was not for sissys." A sharp wit and a strong will were the backbone of her large personality stacked on a five foot frame. She was the most well-read woman or person I've ever met and had in her small, humble home a library full of anthologies that she'd read and re-read. She completed a handful of crossword puzzles every day, hosted a strong bridge club, and had her own home office (she shared with her hubby but it was still definitely hers). To be fair, as storytelling of those who have passed can sometimes lend itself, my relationship with my grandmother was separate, not so much distant, but more of one of observance on both of our parts. I was her youngest grandchild by far, and she one of my two surviving grandparents. And in my mind's eye, the definition of grandmother was someone who baked and cooked and rejoiced when you came to visit. I suppose that childhood image was more of a Mrs. Claus than a real human experience, but Grandma was not a baker, or chef, or, at least at this point in her life, a bearer of sunshine and compliments and anything that she viewed as frivolity. She was an old soul, and she raised her siblings after her parents died. 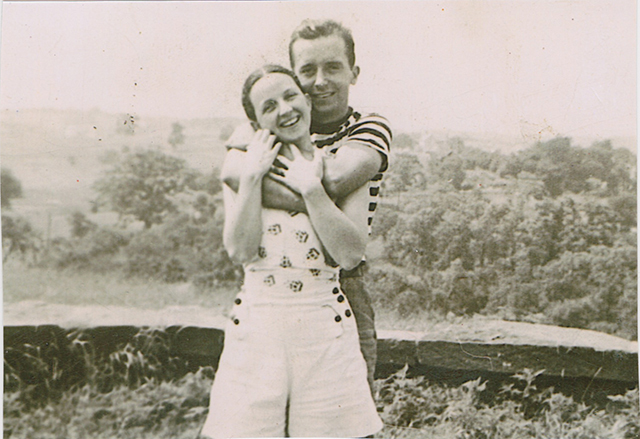 She married my grandfather, who went on to serve in the Navy during wartime, and she was left, as so many veteran wives are, to handle the childrearing and financial supporting on her own. In the 1940's and 1950's, she was-out of necessity and out of pure will-living as a modern-day entrepreneur. She had her own drapery business in the small Western Pennsylvania town where she lived. And she, with her small frame, would lug around massive amounts of fabric and embellishments for her creations out of her home, on the worktables in her unfinished basement. And by the time I came into the world, she had my mom working with her to grow the business and to utilize my mother's creative talents and expertise. And she wrote for the local newspaper, out of that home office, on a typewriter that I can still feel beneath my fingers. She introduced me to pattern and texture, creating toile curtains for her guestroom where I stayed on visits. She embroidered and handstitched her own artwork that adorned her home. And she impressed me even as a young girl with her sense of fashion (often her own designs) and color and boldness. She was not a lady to be passed over when she walked down the street or into the store. She was remarkable and strong, living out the last 25 years of her life in that same home, alone. I may be taking a different path by welcoming a full-time job and my own business and my children and my husband. But I'm certainly not the first, not in my family. And, God help me, if I were to complain about all that lies ahead... pretty sure that Grandam would come after me with that look, right down from Heaven. Here's to those who paved the paths for us, even if we misunderstood their attempts at first. And here's to you, Grandma, Ellen Margaret Mary.